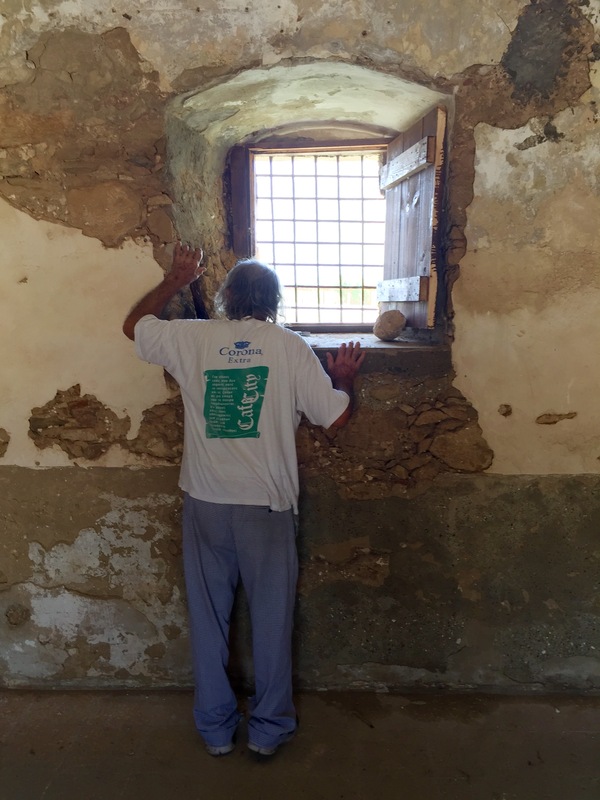 On Monday June 8, 2015, my parents and I took my great-uncle Andreas to his birthplace, Agia Irini. Andreas was born in 1933 and had been a farmer since he was about 12 years old. He had meningitis, a complication of measles, as a child and since the age of 5 he has been deaf, and blind in one eye. He went to school and had a private tutor who came once a week, and he finished primary school. He can read and write, he lip reads and speaks very loudly. Andreas had his limitations but he was a successful farmer. He was very proud of the produce that he grew. He found underground water, bought a pump and set up the village’s first irrigation system. He had many Turkish Cypriot friends. He remembers celebrating Greek and Turkish Cypriot weddings all together and even gave us a demonstration of the dances they would perform and mimed the musical instruments they would play. Andreas had been working in his fields when a friend ran to him in July 1974 and told him that Turkish soldiers were coming – run! He ran; he had nothing but the clothes he wore. He found his way to his brother Iordanis in Nicosia, and stayed with him and his family for a few years. Then in 1979, when he married Iasimoula, they went to live in an abandoned cottage, formerly the home of Turkish Cypriots, in the village of Polis Chryssochous. They had one child, a daughter named not after Andreas’s mother, but after his village – Irini. Andreas had belonged in his ancestral village and the villagers judged him not by his disability but by his character. They knew to face him when talking, so that he could see their lips, but as they’d all grown up together this was no concession – it was second nature. Out of his own village, Andreas could never achieve the success or sense of belonging that he had known before. He has worked at all sorts of odd jobs and even now, at 81, he works at the bakery across the road from his cottage. My parents and I came to Andreas’s house early in the morning and put him in the front seat of the car. The old man didn’t want a seat-belt; within a minute a beeping noise was telling us that his seat-belt wasn’t fastened. That didn’t bother Andreas at all, of course; there are some advantages of deafness! Irini told us that, whenever her mother is annoyed with him and tells him off, he turns away so that he can’t see her. He is a cheerful and cheeky old man. I pulled the seat belt, stretched it behind his seat and fastened it so that the beeping would stop. The first time since July 1974 that he visited his beloved village was in 2013 when a large family group went with him and his brother, my grandfather. Andreas was fixated on finding his water pump, but we couldn’t locate it. On his second visit, again Andreas was adamant that he would find his pump. He was more concerned about finding the pump than about finding old friends. Why? I suspect that the pump is a symbol of his former, successful life all those years ago. Finding the pump would be a sort of affirmation of his identity, melding together the old man and his younger self. After we’d crossed the border to the north, we stopped at a road-side stall to buy strawberries – we could see the field and smell the beautiful aroma of ripe, fresh strawberries. Andreas would not take a single one. The trauma of his flight from his land and the loss of his sense of self as a successful farmer are too strong; he will not spend a cent in the north. When we got to his village, Andreas first wanted to find his pump. We drove along a road and found the field where it should be and he and my father went searching for it. They couldn’t find it; we later found out that it had been moved. Next time we take Andreas, we will make sure that his old friend Huseyin is around, to show us where the pump is now. It is important; it is not just a pump. While in the field where the pump wasn’t, Andreas surveyed the crop of tomatoes. He decided, “This is my field; they are my tomatoes.” When he found a couple of sacks on the ground, he started picking his crop. My mother and I had waited in the car and we saw Andreas and my father coming back to us, each carrying a heavy sack. Oh, no! How could they?! Are we going to end up in a police cell?! Dad said that he couldn’t stop Andreas – the man who turns away to avoid an argument – so he helped him so they could get away more quickly. The sacks went into the boot of the car and we drove off. 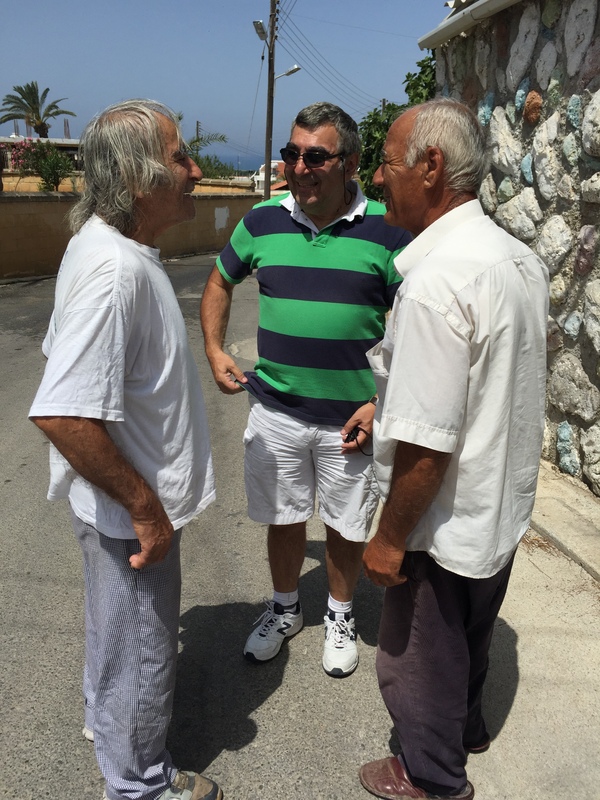 We took him to visit Erol, our good friend in the village whom Andreas had met on his previous visit in 2013. A small village, thank goodness, is full of eyes. One minute after we entered Erol’s kafenion, Andreas had a visitor: Ibrahim, who I had interviewed the week before, recognised us and recognised Andreas, too. It took Andreas a few moments to remember Ibrahim, as he was much younger (and had more hair) the last time he saw him. All of a sudden it clicked, and he was thrilled to see his old friend. 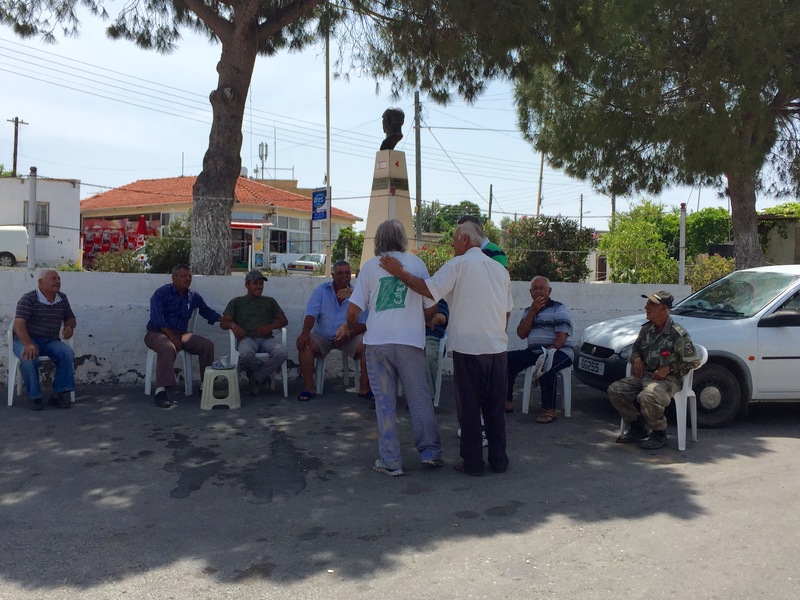 Ibrahim, with his arm around Andreas, brought him over to meet a group of Turkish Cypriot men sitting outside the kafenion. Several of them remembered him and greeted him warmly. Even the young men in the group, born after 1974, had big smiles as they watched the delighted faces of Andreas and his friends. Ibrahim kept his arm around Andreas – claiming him? protecting him? showing the rest of the group that he was someone to welcome? I was so grateful for Ibrahim’s affection, and so glad for my uncle. It was very moving to watch. Another man quickly approached the group and came to Andreas with a smile. Fuat wasn’t recognised, so he took off his hat … and Andeas suddenly smiled from ear to ear, grasped his hand warmly and they started talking. It was a lovely reunion of men who had worked closely together, filled with many laughs. 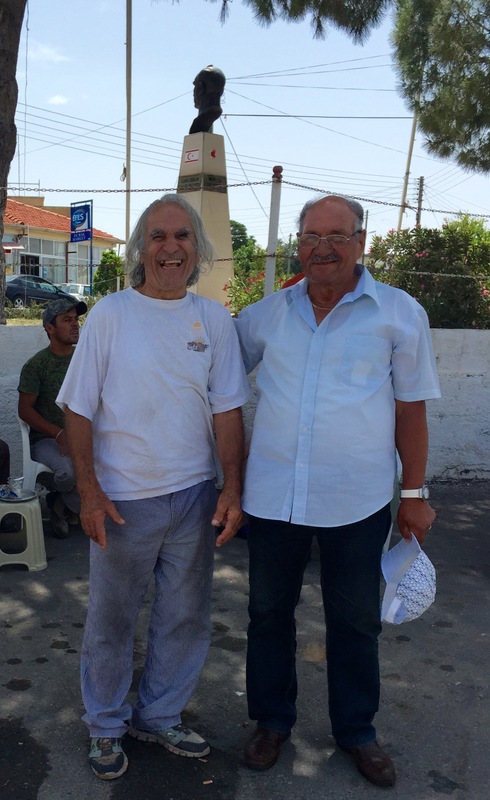 Andreas told us later that many of the Turkish Cypriots of the village worked for him on his land. Not only did he pay them a wage, but he also shared his profits with them, too. He had been loved and respected, and had then fled his land and lost his community. We visited the abandoned church of Agia Irini. Andreas is a deeply devout man. He was very pleased to hear that around 100 people came from the south to celebrate the name day of Agia Irini in May this year, and that the church is due to be restored in 2016. He looked at a young olive sapling outside the church and gestured, What is that? I guess that it was planted on the saint’s name day, in May, as a symbol of a new phase for the old church. Andreas told us that his father, my great-grandfather, built the stone wall around the church. Each time I visit more and more details are being filled in, giving me more and more connections to this village. We drove along the beautiful coast, back to Polis Chryssochous, and took Andreas back home to his wife. A few days later we went and had lunch with them. Iasimina put a lovely fresh salad on the table. Hmm… are they the tomatoes…? Yes! But Andreas didn’t eat any. He doesn’t like tomatoes.